One reason we are interested in lines of support and lines of resistance in a chart is that they can lead to price bounces at those contact areas. And the price bounce is an easy strategy to master with a little bit of practice. When the price meets any kind of support and resistance area it can trigger a price bounce. This can be a daily pivot line, a horizontal price support, a moving average line, or a Bollinger band line to name just a few. The knowledge of where these lines are is central to any trading strategy because this is what allows you to anticipate and time the price bounce and profit from it. A great way to locate bounce trades is with the Bollinger band indicator. 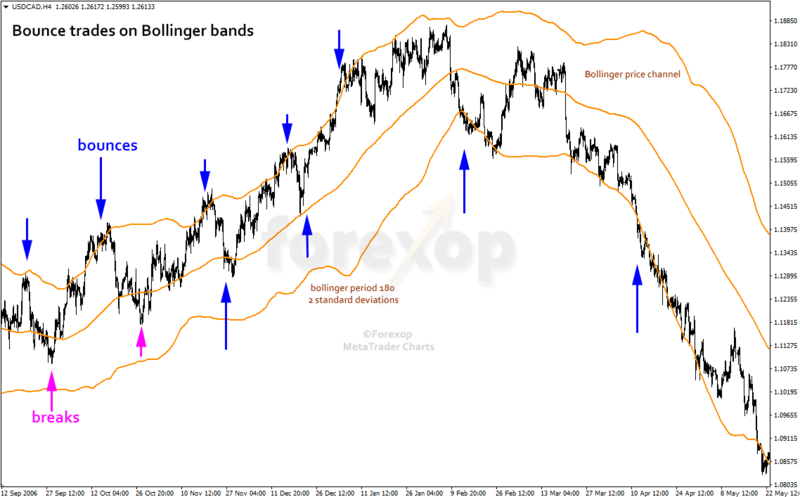 The Bollinger band traces out an upper and lower line, making the so called Bollinger band. 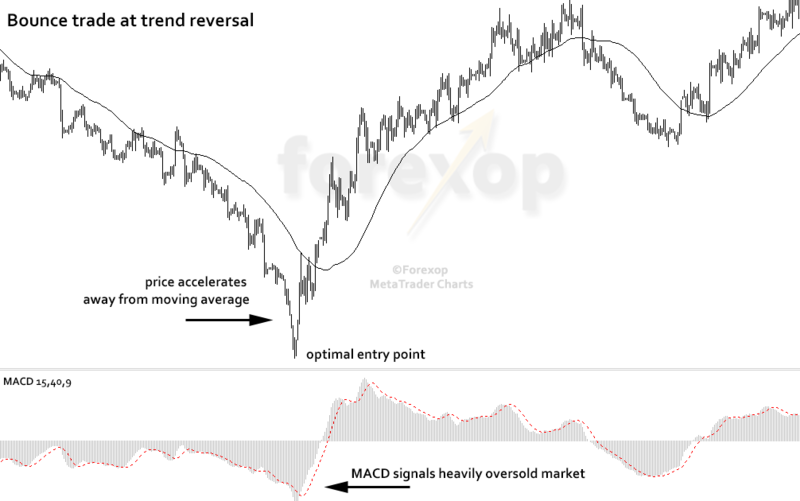 The chart in Figure 1 demonstrates bounce trades from the Bollinger bands indicator. Start with the setup of the Bollinger indicator. Examine the recent price behavior and adjust the indicator so that it fully encloses the price within the upper and lower band, making a clean price channel. This will show where the recent upper and lower price limits are and where the price is reacting to resistance and support most strongly. When the price is rallying it remains fixed within the middle to upper band, which is typical. Here the bounces are stopping the price from rising above the upper band. The center line is offering support. There are two breaks early on in this rally but these don’t hold and the price breaks back above and remains in the upper part of the channel until it levels off. The least risky strategy here is to trade long, to buy as the price bounces from the center line upwards and take profit when it reaches the upper band. In a strong bullish rally, it’s generally not worth the risk to trade the downside. 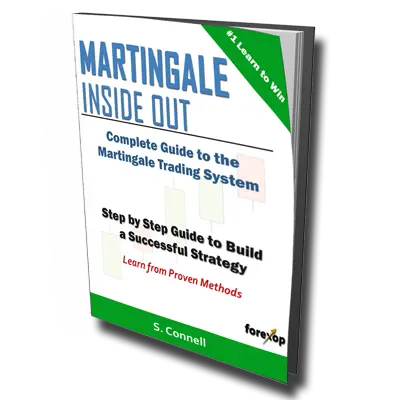 A pivot line bounce happens when the price is range bound within the daily trading range known as the pivot zone. The pivot zone is a series of support/resistance lines that are calculated from the previous day’s trading range. 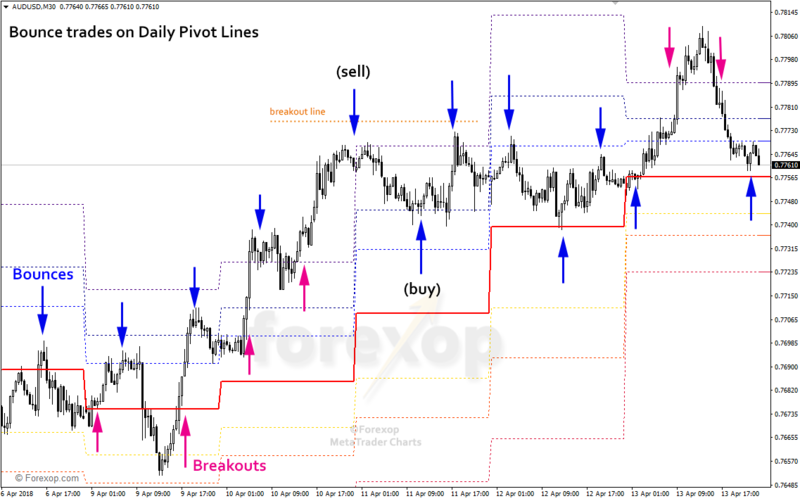 For more on how to find pivot lines please see this article. When the price approaches a pivot we anticipate that the chance of a price bounce is slightly higher than the chance of a cross through. It’s rare to see a clean bounce at a pivot area or from any support/resistance for that matter. More often there is hesitation as the price approaches. When this happens the price slows and consolidates as it meets the pivot line. It may then test the line by crossing briefly before returning thus forming a bounce. A glance at Figure 2 clarifies how this works in practice. This chart shows AUDUSD and its daily pivots here calculated with a pivot indicator using the Fibonacci formula. The central pivot line is in red and the outer pivot line is shown in purple – these are the key supports and resistances. The price is range-bound. It is holding between the main pivot line which acts as a strong support and the upper pivot lines which are creating strong resistance to advancement to higher levels. Over time the price moves higher with a series of bounces marked in blue and a smaller number of breaks marked in purple. To trade a pivot bounce, it is necessary to watch the market activity around the pivot line very carefully. For a bounce, look for hesitation and consolidation around the pivot that shows momentum is slowing. This reduces, but does not entirely eliminate, the chance of a breakout. With a short sell, hold the position until the price meets the next lower support line at which time close with a buy back order. Place the stop loss above the resistance line at a level that represents the breakout line. Figure 2 displays how a short-sell bounce trade would work. Set the breakout line about half way to the next upper pivot line – this will be the stop loss. The long trade works the other way around. Place the buy order after confirmation of a bounce at a support line and hold the position open until the price meets the next pivot resistance. Put the stop loss below the support line. This should be at a level that indicates a bearish breakout has occurred rather than a bounce. The most powerful and most profitable bounces come at a time when a trend is changing direction. If you time these trades accurately, you stand to make a great deal of money. These trades are also the most difficult to pull off successfully. 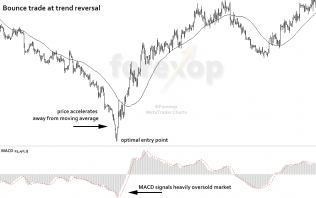 To execute a reversal bounce trade, wait for a suitably strong trend to near its end point. At the end point, the price will usually accelerate in the direction of the trend, stretching away from the moving average. It will become more volatile for a short time. This indicates panic selling in a bear market as those holding long positions scramble to get out. This is known as the point of capitulation. At this time “the market” is not acting rationally. All of the bad (or good in the case of a bull rally) news is already fully priced-in and there is nothing left to react to. This is the last gasp of a dying trend. When this move takes place the price will pull significantly away from the moving average line. Figure 3 depicts this. The MACD lines in the lower chart show how oversold the market has become. The crossover, in this example, flags an extremely good time to buy the bounce. In this scenario, waiting for a crossover of the 200-50 moving average lines, something that’s conventionally used to mark the changing direction of a trend, would have resulted in a much smaller profit, and possibly even a paper loss in the short term.